In a food processor or chopper, combine almonds and parmesan; pulse until as finely ground as you can get them. Pour crumbs onto a plate and mix thoroughly with thyme leaves and panko crumbs. In another bowl place the egg white and stir a bit. 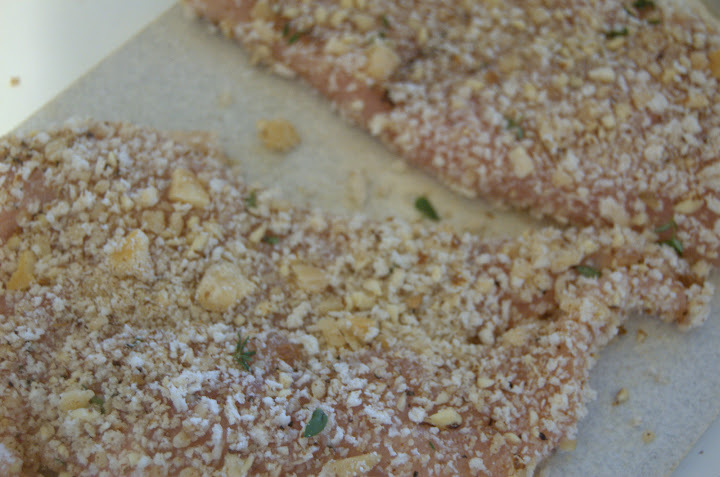 Sprinkle chicken halves with the salt and pepper and then dredge first in the egg and then in the crumb mixture, coating thoroughly and patting the breading in. Place chicken on a plate to rest. Turn oven on to 400F and place a clean cookie sheet in it to warm up. While that’s heating up, chop the potatoes into quarters (or halfs or sixths, depending on the size of the potato), and chop the bell pepper into bite-sized pieces. Place the tomatoes, garlic, chili pepper, onion, a bit of olive oil and salt in another small baking dish. Pull the cookie sheet out of the oven and sprinkle it with olive oil; if it begins to smoke lightly, it’s ready and you can place the peppers and potatoes on it carefully (if not, put it back in the oven for a few more minutes). Place tomatoes in the oven as well and let roast for about 15 minutes. 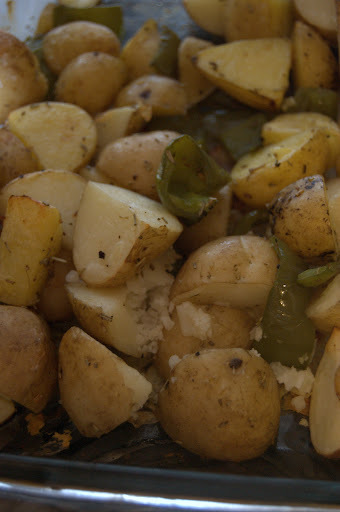 Turn the oven up to 450F tir the peppers and potatoes every so often. When the tomatoes are done, pull them out and let the cool down on the side. Heat up a bit of olive oil in a skillet over medium high heat. Place breaded chicken halves in the pan and cover, cooking until browned on each side, about 4 minutes. 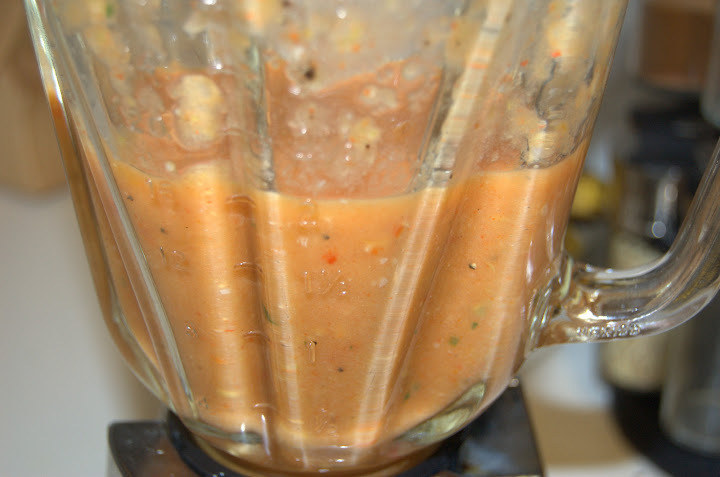 Cut the the tops off the chili pepper and place it, the tomatoes, garlic, onion and 2 basil leaves in a blender and purée into a chunky sauce. Taste and add salt and pepper as necessary. Pull potatoes out of the oven when fork-tender, sprinkle with a bit more olive oil and salt and pepper as necessary, and cover with foil to keep warm. 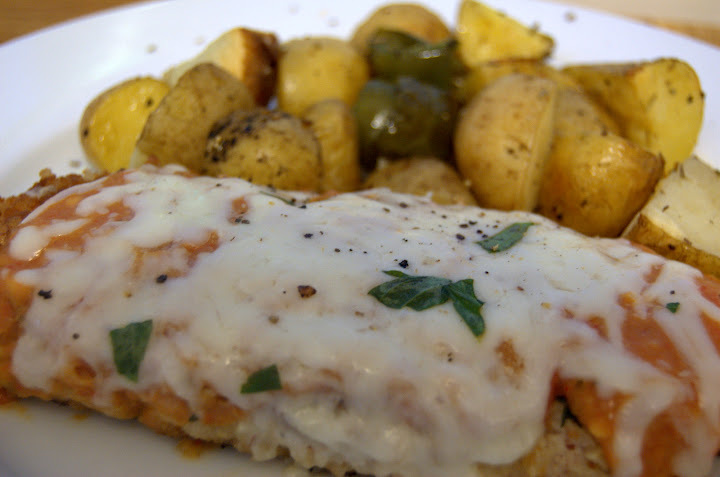 Place the chicken halves in the now-empty tomato pan, coat with sauce and sprinkle each chicken cutlet with half of the mozzarella. Place in the oven and let finish cooking about 7 minutes or until cheese is fully melted and chicken is completely cooked inside. 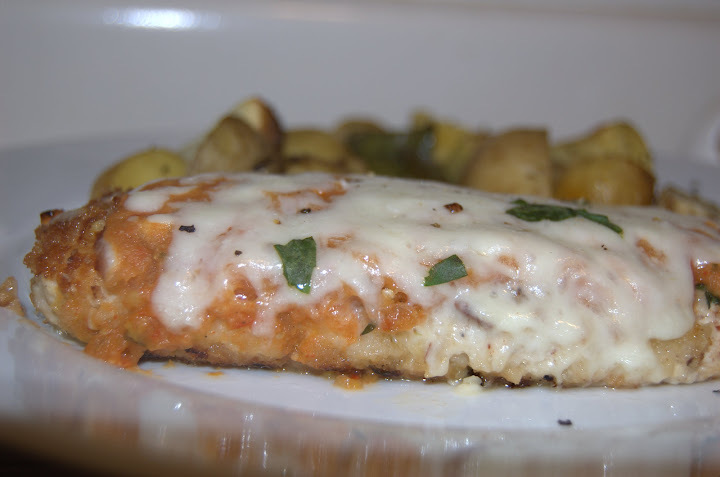 Tear up last basil leave and sprinkle over the chicken. So that’s what we did. It was not too bad for a half-effort. Josh would have preferred a stronger tomato-taste in the sauce and suggested maybe using canned tomatoes, or I think you could add in some tomato paste. I would probably skip the almonds next time; although I did sort of like the extra crunch, I think it gets a bit lost in the sauce. Definitely worth trying again though. If anyone has any actual recipes…send them my way!